6 Now godliness with contentment is great gain. I remember thinking how interesting is was that it said godliness with contentment. That word with, in the Greek, is μετὰ (meta), which in English can be translated as accompanied. I used to wonder at this because I thought, can you even have godliness without contentment? I mean, it seemed to be that part of being godly, was being content. Now that I am older, I see more clearly that a person can indeed be godly without contentment. The word for contentment is αὐτάρκεια (autarkeia) which can be translated contentment or sufficiency. Sufficiency… that is so interesting. 8 And God is able to make all grace abound toward you, that you, always having all sufficiency in all things, may have an abundance for every good work. Having all sufficiency in all things. So it would appear, that according to God’s Word, YES, my current circumstances are sufficient for me to have an abundance for every good work. And it doesn’t take a scholar to look at my life and see what good works lie in my daily path. Honoring, respecting and loving my husband. Teaching my children the Word of God. 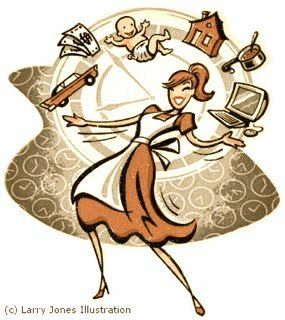 Keeping my house in order by cooking, cleaning and doing what needs to be done. Aiding my children as the grow in knowledge, as their homeschool teacher. That’s a very short list, and yet just focusing on those is enough to keep me hopping! Well, this blog post has taken an entirely different turn from where I thought I was going. That seems to happen to me a lot. But I needed this reminder, the reminder that God has given me all I need to accomplish what is on my plate at this very moment. This moment being the one where I change as many as 12 diapers a day, where I usually get to really talk to my husband for 20 minutes a day, right before I go to bed, where adult contact is seldom, where there are days that I just have to trust that God will provide for all of our financial needs. I know that as time marches on, His grace will be sufficient to see me through other circumstances, too. This entry was posted on Sunday, September 27th, 2009 at 9:46 am	and tagged with I You can follow any responses to this entry through the RSS 2.0 feed. Your desire back then to have what you have now, as you reflect on the back then of it all. Yup, I totally get that! Remember, this day of overwhelming shall pass. I know that you know this already. Sometimes I think our hearts are burdened more than ever because we become much more AWARE of the things around us– both the seen and the unseen. I am so thankful for you! Thankful that you are my friend. And I am praying for you rightthisverysecond.